David Malo (or Davida Malo) was a leading Native Hawaiian historian and scholar of the Kingdom of Hawaii. He was born in Keauhou on the Island of Hawai’i around 1793. He spelled his name Davida, since syllables always end in vowels in the Hawaiian Language. His father was named Ao’ao and mother was named Heone. He grew up during the period when Kamehameha I united the islands into a single kingdom. Malo was associated with the chief Kuakini, who was a brother of Queen Ka’ahumanu, during this time of great change, probably serving as oral historian and court genealogist. 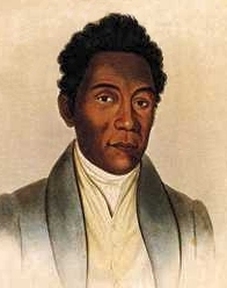 In 1823 Malo moved to Lahaina on the Hawaiian island of Maui and became a student of Reverend William Richards, learning how to read and write in both English and Hawaiian. Malo converted to Christianity and was given the baptismal name of David. He was a member of the first class at the Lahainaluna School when it was founded by Lorin Andrews in 1831, later serving as school master. He married Lepeka, who took the Christian name Rebecca. They had one daughter. Lahainaluna High School has named the Boys’ Dormitory after David Malo, and in mid-April each year holds a celebration in his honor. When Queen Ka’ahumanu died in June 1832, Malo composed a poem in her honor titled He Kanikau o Ka’ahumanu. He helped translate books from the Bible so they could be published in the Hawaiian language. From about 1835 he started writing notes on the Hawaiian religion and cultural history, along with other members of the school and instructor Sheldon Dibble. The book was first published in Hawaiian around 1838 (a facsimile of this original has been recently reprinted). In 1858 more stories were added to his book and a second Hawaiian edition was published. The book was translated by Nathaniel Bright Emerson and published in English in 1898, and again in 1951 and 1987 editions. This book is known today as Ancient Hawaiian Antiquities and can be read here. He helped form the first Hawaiian Historical Society with Samuel Kamakau in 1841. He wrote a history of Kamehameha I, but the manuscript has been lost. Also in 1841 he was elected as representative from Maui to the first House of Representatives of the Kingdom. In 1852 he supervised building Kilolani Church on Maui. Its ruins are now on the grounds of the Trinity Episcopal Church by-the-Sea near modern day Kihei. He was ordained into the Christian ministry and settled down in the seaside village of Kalepolepo on East Maui where he remained until his death on October 21, 1853.